Enclosed inside a main-housing there are two sets of worm-gears which work together with their relevant Driving-gears and Exit-shafts. Similar to other LSD's the housing is driven. 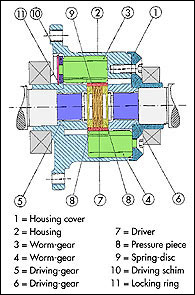 The housing transmits the torque via the two sets of worm-gears to the driving gears 5 and 6 which in turn transmit torque to the exit-shafts. 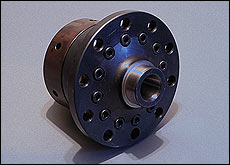 The worm-gears are obstructingly coupled to the driving-gears. Advantages of the design are, very smooth operation and long life. The LSD uses the special attribute of the worm-gear for variable locking as follows. The locking action between the left and right worm-gear sets depend on their angle of inclination to each other, ie. the greater the angle the greater the locking effect. The angle increases proportionally to the increase in difference of rotation of the left and right wheels. The locking action therefore smoothly increases from a preset 10% to a maximum possible limited slip of 75%. The latter figure is predetermined by the pitch angle of the worm-gear during manufacture.